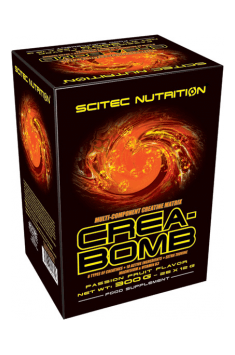 Scitec Crea-Bomb is a unique product, containing a highly anabolic mix of ingredients - six forms of creatine and substances that support its intracellular action. The applied form of a well-soluble powder allows to prepare a tasty drink that will increase the training capacity, strength and muscle mass. Creatine – the most and the best studied substance used by masses of strength sportsmen. It shows strong anabolic effects on many levels, and also increases the amount of available metabolic energy for the muscle cells. It boosts the efficiency of the body and allows you to perform much more effective training sessions. Anhydrous creatine - a 100% pure form of this anabolic tripeptide, which is characterized by a high chemical stability. Creatine monohydrate - the most popular form, used in three varieties: a standard monohydrate, micronized with significantly better bioavailability and the patented in 2002 KreAlkalyn® formula containing the most stable form of monohydrate, which undergoes much less conversion to creatinine. Citrate and pyruvate are creatine molecules linked to intermediates of intracellular metabolic pathways. This combination enables even more efficient energy generation in both aerobic and anaerobic environment. Additional ingredients - vitamin B3 (in the form of niacin and nicotinamide), magnesium oxide, taurine, malic acid used to increase the bioavailability of creatine. Within the muscle cells, they improve the activity of enzymes that supervise intracellular respiration. The majority of people practicing strength sports reaches the plateau or desires to reach their goals faster. Entering the ‘higher level’ does not have to involve the use of hormonal pharmacological support. Supplements with high anabolic potential are present on the market - they include creatine. There is still a debate about which of its forms is the best. The producer, cutting off these discussions, used various forms in his preparation, so that the extracted anabolic potential would be as large as possible. The basic function of creatine is the storage of energy in muscle cells and its release in case of need to perform contraction. It is not surprising, therefore, that much higher concentration (as in the case of a long period of supplementation) improves the efficiency of muscle fibers by increasing their strength. In addition to the obvious action of the tripeptide, other molecular points of its uptake were also known. Protein that physiologically limits the muscle growth is myostatin. It has been observed that supplementation with creatine contributes to the reduction of its activity, thereby suppressing its inhibitory effect on the development of musculature. Each cell has a system for conveying the information whereby the legitimacy of specific changes is adjusted. One of such systems is the so-called cascade of ERK and MAPK kinases. The most important process in muscle cells is the biosynthesis of enzymatic and structural proteins. It has been shown that creatine by increasing the activity of ERK and MAPK kinases intensifies the superstructure process, indirectly inhibiting catabolism of proteins, which positively increases the nitrogen balance. Heavy training requires a lot of energy. Its basic source for muscle cells is glucose, which combustion in anaerobic transformation generates a large amount of lactic acid. It was observed that creatine as an intracellular buffer, limits its production. In addition, during a long-term creatine supplementation, the concentration of its phosphorylated form is increased in muscle cells. Raising the amount of quickly available energy resources contributes to the reduced mobilization of glycogen - the glucose store. The preservation of its stocks together with a reduction in the production of lactic acid leads to the reduction in a fatigue and allows for longer training sessions. All metabolic processes are supervised by various types of enzymes. In order to fulfill their functions, they require the presence of coenzymes, which include vitamins or microelements. The micromolecules contained in the preparation are also responsible for the precise regulation of the energy production. Magnesium supplementation is especially common among people suffering from chronic muscle spasms. It has its justification, because this cation competes with calcium, inhibiting the excessive shrinkage of myofilaments. In addition, magnesium together with vitamin B3, as one of the coenzymes involved in intracellular respiration processes, promote the production of ATP in the muscle cells. An extremely common non-protein amino acid is taurine. Its addition to the preparation is not accidental. It has been proven that its combination with creatine enhances the cooperation of both compounds in the field of intracellular transport. In addition, taurine as an antioxidant reduces free radicals formed during an intense workout, promoting much faster muscle recovery. Malic acid acts as a stabilizer of magnesium cations in myocytes and also significantly increases the bioavailability of creatine for muscle cells. In summary, Scitec Crea-Bomb is a top-quality stack of six forms of creatine, whose high anabolic potential is not limited only to the short-term support of performance during the training sessions, but also reinforces the recovery and rebuilding of stronger muscle fibers. Take 1 portion in the morning on an empty stomach and one portion immediately after training. Take one portion in the morning on an empty stomach and one portion in the afternoon between meals. On non-training days 1 portion used in the morning should be sufficient. There is no need to use on an empty stomach, using after a meal will also be effective. Minimum 8 weeks of use should bring satisfying effects. Grapefruit: Flavor (Grapefruit), Acidity Regulator (Citric Acid Anhydrous), Sweeteners (Acesulfame K, Sucralose), Anti-Caking Agent (Tricalcium Phosphate), Colors (Riboflavin, Carmoisine**). // Passion fruit: Flavor (Passionfruit), Sweeteners (Sucralose, Acesulfame K), Anti-Caking Agent (Tricalcium Phosphate), Colors (Riboflavin, Carmoisine**). // Pink lemonade: Flavor (Pink Lemonade), Anti-Caking Agent (Tricalcium Phosphate), Color (Beetroot Red), Sweeteners (Acesulfame K, Sucralose), Acidity Regulator (Citric Acid Anhydrous). / ** May have an adverse effect on activity and attention in children.